Lt-Gen Kapil Vij, who was transferred for taking his troops very close to the border with Pakistan as the Commander of a strike force during the 10-month-long “Operation Parakram” last year, was today conferred with the Ati Vishisht Seva Medal by President A.P.J. Abdul Kalam. Taking suo-motu cognisance of terrorist killings of Kashmiri Pandits on Monday, the National Human Rights Commission has called upon the Secretary, Ministry of Home Affairs and the Jammu and Kashmir Chief Secretary to submit to the commission a factual report on the massacre. Did leaders spoil gas victims’ case? Is editor’s primacy under threat? The Prime Minister, Mr Atal Behari Vajpayee, today spoke to the Gujarat Chief Minister, Mr Narendra Modi, immediately after getting the news that Mr Haren Pandya had been assassinated in Ahmedabad. To review the political situation in Uttar Pradesh, BJP President M. Venkaiah Naidu has convened a meeting of party MLAs from the state on April 1 here. The meeting, likely to be attended by Deputy Prime Minister L K Advani also, would review the political situation in the state. While expressing concern over the poor credit availability to agricultural sector, Union Agriculture Minister Ajit Singh said the national agricultural policy envisages 35 per cent growth rate from the present seven per cent. A Delhi court today granted custodial parole for five days to key accused in the Shivani murder case R.K. Sharma, a senior IPS officer, to attend his daughter’s wedding scheduled for April 20. Passengers arriving at Kolkata, Delhi, Mumbai and Chennai airports directly from Singapore, Thailand, Malaysia, Vietnam, Hong Kong, China and other South-Asian countries will now have to undergo health check-up at the airport before entering into the respective cities. The Delhi government has set up 345 computerised pollution checking centres near the entry points for the convenience of outstation vehicles to have their pollution levels checked before entering the Capital. DMK MLAs were physically lifted and moved out of the Tamil Nadu Assembly today “for obstructing proceedings” of the house. Lt-Gen Kapil Vij, who was transferred for taking his troops very close to the border with Pakistan as the Commander of a strike force during the 10-month-long “Operation Parakram” last year, was today conferred with the Ati Vishisht Seva Medal (AVSM) by President A.P.J. Abdul Kalam. 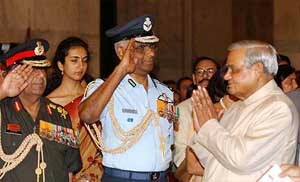 Sixtynine other defence personnel were also decorated with gallantry awards by the President, who is also the Supreme Commander of the Armed Forces, for their services in the security of the nation at an hour-long “Defence Investiture” ceremony at the Darbar Hall of Rashtrapati Bhavan. Prime Minister Atal Behari Vajpayee, Deputy Prime Minister L.K. Advani, former Prime Minister I.K. Gujral, Defence Minister George Fernandes, the three Service Chiefs and senior civil and military officials attended the ceremony. In all, the President gave away 70 gallantry awards — 16 PVSMs, two Kirti Chakras, 2 Bar to AVSM, 22 Bar to Shaurya Chakra and 27 Shaurya Chakras. Earlier this month, the President had conferred around 65 defence personnel with gallantry awards. The PVSM awardees were: Lt-Gen Dinesh Singh Chauhan, Vice-Admiral O.P. Bansal, Air Marshal D.S. Nigam, Air Marshal S.P. Tyagi, Lt-Gen Kamleshwar Davar, Lt-Gen Mahesh Vij, Lt-Gen Hari Uniyal, Lt-Gen Tejinder Jit Singh Gill, Lt-Gen Parinder Paul Singh Bindra, Lt-Gen Prakash Suri, Lt-Gen R.K. Mehta, Lt-Gen Sarvjit Singh Chahal, Lt-Gen Bijoy Nandan Sahahi, Vice-Admiral Pravesh Jaitly, Air Marshal Ashok Kumar Goel and Air Marshal Satish Kumar Ramlal Dham. Kirti Chakras were awarded to Naib Subedar Ishwar Singh and Havildar Rudal Prasad (posthumous). Bar to AVSM were conferred on Lt-Gen Satish Prakash Kalra and Maj-Gen Moovera Chinnappa Najappa. The AVSM awardees were Lt-Gen. Kapil Vij, Lt-Gen Padam Pal Singh Bhandari, Maj-Gen Arvind Sharma, Maj-Gen Kuldip Chandra Vig, Maj-Gen Amrik Singh, Maj-Gen Anand Sagar Bhagat, Maj-Gen Ajit Singh Bajwa, Maj-Gen Arvind Mahajan, Maj-Gen Jitendra Singh, Maj-Gen Purshotam Vig, Maj-Gen Avinash K. Sarwate, Maj-Gen Pawan Kumar Chhiber, Rear Admiral Pratap Singh Byce, Rear Admiral Subramaniam Madhavan, Air Vice-Marshal Babu Ajit Kumar Shetty, Air Vice-Marshal Ambrish Kumar, Air Vice-Marshal Subhanka Shekhar Lahiri, Air Vice-Marshal Ramyar Keki Batha, Commodore Thayi Hari, Commando Arun Kumar, Air Commodore Rishi Pal Singh and Air Commodore Suryakant Nijananad Bai. Bar to Shaurya Chakra was conferred on Major Sukhmeet Singh. The commission has also forwarded to the two respondents a copy of the petition sent by the Kashmiri Samiti on the tragic incident and asked them to report on the matter. It has also asked the respondents to spell out what measures they plan to take to enhance the security of the affected community. The commission said the incident was an unspeakable act of violence that had taken innocent lives and was a testimony of the depravity of those engaged in terrorist acts. Condemning terrorist acts and its perpetrators, the commission said such acts were deeply hostile to human rights and the right to life. In a petition moved by Mr Ashok Bhan on behalf of Kashmiri Samiti, the nodal organisation of Kashmiri Pandits, sought a compensation of Rs 15 lakh to the next of kin of those killed in the Nadimarg massacre, stern action against those “conniving” with the policemen and a probe into the pattern of massacres against the Kashmiri Pandit community from time to time. Mr Modi, who spoke to the BJP President, Mr M. Venkaiah Naidu, on phone from the state Capital, said the state government wanted the probe to be conducted by the CBI in view of the Opposition’s demand in the Assembly for the resignation of the Chief Minister for alleged breakdown of law and order in the context Mr Pandya’s murder, Mr Naidu told newspersons here. Mr Naidu said Mr Modi told him that the Opposition was “seeking to divert the people’s attention and give a political colour to the incident”. Mr Advani and Mr Naidu along with many Cabinet Ministers are slated to take part in the funeral of the former Gujarat Home Minister in Ahemdabad tomorrow. Earlier, the Prime Minister termed as “dastardly and cowardly” the killing of Mr Pandya and said his death had left a void which would be difficult to fill. Mr Pandya was a popular political and social leader of Gujarat and was known for his zeal and commitment to the welfare of the masses, the Prime Minister added. Mr Pandya was nominated as the member of the National Executive of the BJP only recently and was to have attended the two-day meeting at Indore commencing from April 4. Party General Secretary Pramod Mahajan said it was a big shock for him to know about the murder. Mr Pandya was to come to Delhi shortly before proceeding to Indore, he added. India has put on hold the contingency plan to evacuate Indians living in Kuwait as the situation there is normal. Civil Aviation Secretary K. Roy Paul, who has just returned from his visit to Kuwait, told reporters here today that the evacuation plan had been put on hold as the Indians living in Kuwait were not feeling unsafe. He, however, said the contingency plan was still in place and if need be it would be put in place to evacuate the Indians. He added the Government of India was committed to the safety of the Indians living in Kuwait and would do everything to ensure their safety. Mr Paul, who met the leaders of the Indian community in Kuwait and the Kuwaiti authorities, said except for the panic calls from the relatives living in India, the Indians in Kuwait were not feeling unsafe. “The life is absolutely normal, except for an occasional siren,” he said and added that a large number of aeroplane bookings were now being cancelled by the Indians. The Civil Aviation Secretary informed that the Kuwaiti airspace and airport were open and the Air-India and the Indian Airlines were operating normal weekly flights to and from Kuwait. However, the passenger traffic to and from Kuwait had gone down by almost 50 per cent as a result of the war in Iraq. But he pointed out that all the Air-India flights were operating ex-Mumbai and returning the same day. This, he said, was being done as the crew was not staying in Kuwait due to precautionary reasons. When asked about the impact that the war would have on the Air-India revenue, Mr Paul said although no major exercise had been undertaken to make an evaluation but, there would be no major impact as such. He, however, agreed that the traffic to and from Kuwait had gone down and the flights were taking a small detour which could have a marginal effect. Condemning the US-led war on Iraq, three former Prime Ministers and leaders of different Opposition parties today urged the government to take a “categorical stand” and appealed to the people to observe March 31 as a nationwide protest day. 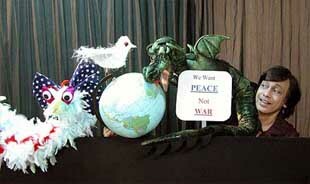 Claiming that the war was “illegal and unjust”, the leaders, including former Prime Ministers V.P. Singh, H.D. Deve Gowda and I.K. Gujral, said it was being conducted in “flagrant defiance of world opinion”. To review the political situation in Uttar Pradesh, BJP President M. Venkaiah Naidu has convened a meeting of party MLAs from the state on April 1 here. The meeting, likely to be attended by Deputy Prime Minister L K Advani also, would review the political situation in the state. All five general secretaries of the party would attend the meeting, BJP spokesman Mukhtar Abbas Naqvi told newspersons here. He said the two parties had an informal mechanism of coordination which was functioning smoothly with regular interaction between party leadership and its cadres. However, the meeting, being held three days ahead of the party’s national executive meeting in Indore, assumes great significance as some of the BJP legislators and senior leaders in Uttar Pradesh had been openly criticising the style of functioning of state Chief Minister Mayawati. Mr Naidu and Mr Advani had held a meeting with Uttar Pradesh leaders on March 1 to review the situation. The meeting on April 1 was a part of the move to ensure that the two partners maintain good relations. The BSP-BJP relations soured in the wake of the arrest of Independent MLA Raja Bhaiyya and his father under POTA. The move annoyed a section of the BJP leadership with party General Secretary Rajnath Singh and state unit president Vinay Katiyar publicly expressing resentment on the action by the state government. A section of the BJP was of the view that continuing alliance with the BSP would prove “electorally harmful” to the party, though the Central leadership is felt that the party stands to gain in the Lok Sabha elections slated for next year, where the understanding was likely to be the BJP fielding 50 candidates and remaining 35 going to the BSP. Ms Mayawati had taken strong exception to UP state resident Katiyar quoting B R Ambedkar on partition and complained to the Central leadership making the party ask him to refrain from making such remarks. On the Bhojshala issue in Madhya Pradesh, Mr Naqvi said a three-member BJP team would visit the controversial Bhojshala shrine in Dhar district of Madhya Pradesh to study the situation, arising out of the dispute between the Sangh Parivar and Muslim bodies. The team, comprising S.S. Ahluwalia, Balbir Punj and Shivraj Singh Chauhan, would submit a report on the situation to the party’s national executive, slated to meet in Indore on April 4 and 5, Mr Naqvi said. The Bhojshala controversy had set off violence and bandh by Sangh Parivar activists in Dhar and surrounding areas. The policy, he said, in the processing sector envisages a growth of 10 per cent from the present two per cent, so as to protect the returns to the producers by an efficient management of plenty. Addressing the 56th meeting of the General Council of National Cooperative Development Corporation (NCDC), he said urgent steps would have to be taken to deal with the poor financial health of the cooperative banks and the poor credit availability to agricultural sector. During a meeting on cooperatives, Finance Ministry’s policy on interest rates also came in for criticism by the representatives of the sector. “The rate of interest at which credit is disbursed to the farmers is a very big issue, it is a serious problem, input costs have risen when funds available for the sector are less,” the Agriculture Minister said here. He said the issue would be taken up with the Finance Ministry and the budget announcement this year of interest rate flexibility was unlikely to be of any benefit to the farmers. Sharma was given the liberty by Additional Sessions Judge J.M. Mallik to choose the five days and intimate the same to the authorities at Tihar Jail, where he is at present lodged on charges of murdering the scribe. However, the judge asked the policemen to accompany Sharma in plain clothes “wherever he travelled including places in Chandigarh, Panchkula, Karnal, Delhi and Allahabad”. The step, which is mandatory, has been taken jointly by the Union Health Ministry and the Civil Aviation Department to save the people from pneumonia and other viral diseases, which have spread widely in some South-Asian countries, a Civil Aviation Department spokesman said. At Kolkata’s Netaji Subhas International Airport, three special health counters were opened yesterday, where six foreign nationals flying by Royal Nepal Airlines from Hong Kong and Bangkok had been detained to their surprise due to detection of pneumonia germs in their blood. The respective Consulate and Embassy authorities in Kolkata had been contacted for arranging their return. Come April 1, the latest computerised PUC with the photo of the registration plate, which promises to keep Delhi pollution-free would cost Rs 25 for a petrol vehicle and Rs 50 for a diesel vehicle and the process takes just 15-minutes. Besides the taxis and other smaller vehicles, the heavy vehicles like the trucks and other commercial vehicles do not carry authentic pollution certificates. The trouble started when DMK MLAs demanded that deputy leader Duraimurugan be given an opportunity to reply to a charge by the Chief Minister yesterday that he had pulled her saree inside the Assembly during the violent incidents that rocked the house on March 25, 1989.